6.0 x 4.3 x 2.3 cm. 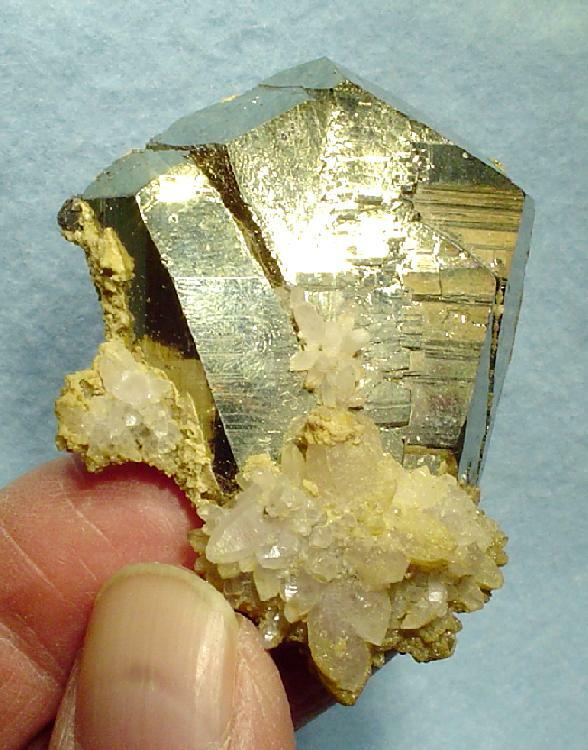 A fine, mirror-bright, brass-yellow pyrite pyritohedron is beautifully accented with three quartz crystal rosettes on this specimen from the Alimon Mine at Huaron, Peru. Overall, a highly unusual piece. The pyrite is pristine and rests on a thin crust of matrix. Pyritohedrons are very uncommon from Huaron, as most are cubes. This is one of the very finest and more unusual pyrite combination specimens that I have seen from the Alimon Mine. Pieces of this quality came out in the mid-1980s. Ex. Jaime Bird Collection.